Oswald Seidensticker, born in Gottingen, Hanover, Germany, on November 3, 1825. His father, Georg Friedrich Seidenstiker, Ph.D., was a liberal lawyer whose political activities led to his deportation to America in 1846. In this same year, Oswald Seidensticker graduated from the University of Gottingen with the degree of Doctor of Philosophy, and he and the rest of his family joined Georg Seidenstiker in America. From 1852 to 1866 young Oswald directed several private schools in Bayridge, Brooklyn, and Philadelphia. 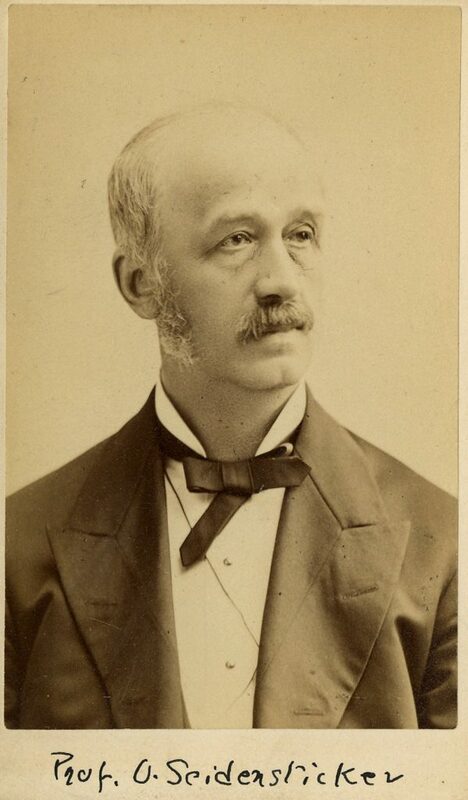 In 1867, Oswald Seidensticker was named to the newly established professorship of German language at the University of Pennsylvania, a position he held until his death in 1894. His ground-breaking research into the history of Germans in Pennsylvania led to exploration of all types of sources, including government documents, church registers, tombstones and individual reminiscences. His many books include The First German Immigration to America and the Founding of Germantown in 1683 (published in German, 1883) and The First Century of German Printing in America (published in English, 1893). One of his scholarly articles, describing the travels of William Penn in Germany and Holland, can be read in an 1878 issue of the Pennsylvania Magazine of History and Biography. He was also extremely active in the German Society of Pennsylvania, serving on various committees and as librarian. According to the 1860 and 1870 censuses, he and his wife Emma had at least one daughter.